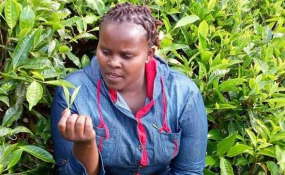 Residents of Kamuiru village of Kiharu Constituency in Murang'a County have been left in shock following the discovery of the body of a 32-year-old woman in her lover's house. The lifeless body of Judy Wanjiru Gacheru, a mother of two, was found on a bed inside her boyfriend's house. Villagers claim the couple were last seen together on Monday at a bar in Maragua town. Murang'a East OCPD Janet Wasige told the Nation that police have launched a manhunt for the man who has since gone missing following the incident. She said police recovered a panga at the scene, which they suspect was used in Ms Wanjiru's murder. "The main suspect is a well-known man and we hope that we shall have no difficulties in tracing him. The suspect and the deceased were last seen together on Monday taking beer at Mid-Way bar in Maragua town," the police boss said. "We suspect that the deceased was killed the same night as her body was not flesh and had an odour," she added. The strong smell emanating from the main suspect's house is what aroused suspicious from members of public. They informed the area chief who then called in the police officers. It is suspected that the killer bludgeoned the deceased with a hammer before slitting her throat using a panga. Villagers who spoke to the Nation said the two lovers often spotted hanging out together. They said the man operated a boda boda at Mukuyu market while the woman was a barmaid in Maragua for a long time. "We are shocked by the killing of this very jovial woman," a woman who did not wish to be identified told the Nation. The woman's murder comes even as the police in Kahuro Sub-county, Kiharu Constituency still pursuing the killers of a 52-year-old man who was found dead after being clobbered with a jembe stick.